Class 3-E is getting ready for their class trip to Kyoto, and Koro-sensei is as excited as ever! Nagisa is in a group with Kaede, Karma, Tomohito, Manami, and the class idol Yukiko Kanzaki. The students are aware of the fact that this is a great opportunity to assassinate Koro-sensei, but they cannot help having great time with him. However, the trip becomes even more exciting and dangerous when they get attacked by a bunch of delinquents who kidnap the girls. As if that is not enough, there is a hired sniper named Red Eye lurking around, ready to be the one who would assassinate Koro-sensei and claim the prize. Can the students of Class 3-E rely on Koro-sensei even now? Note: I've read the manga of Assassination Classroom prior to watching this special. Reading the manga is not necessary at all before watching this and if anything, this may just make you want to read it as well. This does skip a little ahead to the Kyoto school trip but it's not that far into the story. That said, this is a good 30 minute special episode that's main purpose is just to promote the manga. It begins with an initial setup of the story to clear a few things up for people who have not read the manga. For anyone reading this review who hasn't read the manga, just read the summary on MAL first, it'll take less time than me explaining it (and again, it's explained in the episode). This episode includes three stories from Class E's field trip to Kyoto: an issue that Nagisa and his group run into, an assassin that is working together with Class E to try and snipe Korosensei, and some antics back at the inn they are staying at. The animation is pretty good for a stand-alone episode, though seeing Nagisa, Karma, and Kaede's vividly colored hair alongside everyone else's brown/black hair was strange. Korosensei is well animated in all his weird, gelatinous, tentacular, alien-ness. His emotion color-changes are well done, and the only small problem I had with him was his voice actor. It's just my personal issue and not something that applies to everyone, but I always imagined his voice being higher pitched than that. The rest of the characters' voices (especially Nagisa's) fit them well. Whether you've read Assassination Classroom or not, I recommend watching this special. If you enjoy the manga, I'm sure you'll enjoy this. If you haven't read it yet, maybe this will help you find a new manga you enjoy. 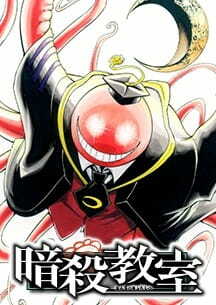 Assassination: Classroom is one of my top manga for sure. Those who mentioned this skips ahead are correct. But the average viewer will be able to watch it just fine without any trouble. This is a combination of slapstick comedy, a tiny bit of tragedy, and positive "we can do it" thinking, and it works so well. I love how it can be hilariously funny at one moment, then make you feel for the characters the next, making you want to say, "You can do it!" The positive feel of the story really can make a bad day better; often, I've had a horrid day, and then read a chapter or two and it turned things around nicely. I saved this special anime episode for just such a moment, and it did not fail to please. The villains of the story (such as the upper classmen) are easily detestable, and you love watching them get what's coming to them. The protagonists were spot on. I can't wait to see more when it continues. If you're looking for a serious, down to earth story, look elsewhere. If you want a cute, fun story that will tug on your heartstrings, you'll love this. Let me tell you something as someone who watched and enjoyed the TV series that aired in 2015: Assassination Classroom is a great series, that is wildly enjoyable. I would highly recommend watching the series (linked on the MAL profile). I would watch this special episode if you can't get enough of the series. Good old Assassination Classroom. This is a great arc that has good pacing and (although predictable) a decent story line. The series is very humorous, which actually provides most of the twists. Actually this is the worst part about the series. The animation is very pathetic and has pretty much nothing working for it. Granted that reflects the budget. Despite how poorly made the episode is, the characters are still distinguishable and recognizable. I'll just come out and say it: most of the voice actors are all wrong and the acting is pretty weak, especially Koro-sensei. The sound effects are fine, but not notable. The series lacks any noticeable sound track. The cast of this anime is fantastic, not matter how you spin it. The anime doesn't do a very good job at helping the characters come to life in that the animation and voice action is bad, but the characters as a whole reflect the greatness seen in the anime. This arch is very nice and touches on most of the cast for at least a little bit. It is also great how side characters (like Red Eye?) get enough screen time to develop and become likable. I actually liked watching this special. Seeing how the series started is interesting to me as a fan of both the anime and the manga. As I said before, this is one of my favorite arcs, and you can see how much it improved when comparing the 2015 TV show to this. Okay so I weighted some of the aspects more than others. my statement on this would be "A fun watch if you are a fan of the series!" Do not watch this after the anime series! Either watch it first, or wait an amount of time, it was a bit of a let down for me, because it was re-telling a story I already knew and was of, in my opinion, worse quality than the anime. Story: The story is fairly short, only covering a few chapters worth of the manga to tell what is one of my favourite early arcs of the story. The story was quite good still, and it stayed faithful to its source without making crazy changes like some do. 8/10. Art: The animation of this OVA was not to my preference, I did not like the full body colour changes of Koro-Sensei, and I think that it was a bit awkward looking at times. That being said, it was never bad, so 6/10. Sound: The sound-quality from what I watched (may have just been my stream issue or something) was fairly poor, but the background music was alright. I don't think that a deep voice really fits Koro-Sensei's character, nor did I particularly like any of the other cast choices. 6/10. Character: The characters themselves, were left perfectly fine, but as it is an OVA none of them had too much depth, that being said they were still adapted quite well, 8/10. Enjoyment: This is based on my experience, and I am giving it a 7/10 for enjoyment, that is factoring into account everything that I just accounted for and my personal feelings towards it when I watched it, feeling that it dragged on a bit. Overall: This was not a bad anime, but I think I ruined my experience of it by watching the main series first, which is definitely the better adaptation. In saying that, I still think that a 7/10 is a fair score, I would recommend this, but only if you were willing to watch the main series afterward, or had some prior manga experience for more context on the characters.